Edited by Ahmed AbdelRaouf ElGeidie . It goes without saying that the introduction of laparoscopy, with its well known advantages, changed the face of surgery. Big surgeons make big incision is now proved to be incorrect dictum. Now surgeons can work via key holes to reach areas considered to be very difficult to reach in open surgery. No more ugly big wounds, no more adhesions, less pain, rapid recovery …. and many more. For all these benefits, patients ask their surgeons for laparoscopy. 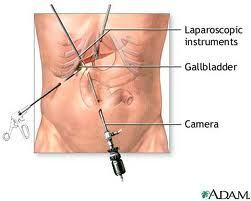 However, laparoscopy is not that easy. It requires new skills and talents that differ from those required in open surgery. It is more difficult and needs more experience and training. We tried in this book to present evidence-based up-to-date information in laparoscopic surgery. This book does not cover all minimally invasive abdominal surgery; only included selected topics covering a variety of medical conditions. Each chapter is written by an expert in laparoscopy. The book is geared not only toward surgical residents in-training, but also to expert surgeons who seek for a recent solution of some controversies. I would like to dedicate this book to my wife Reham, my daughter Salma and my son Omar. Undertaking this book steals time from family, and I very much appreciate their support. I believe you will find this book up-to-date and a useful read that could help you in growing your surgical knowledge about laparoscopy for the sake of your patients.